RICHLAND, Wash. – Researchers at Washington State University Tri-Cities have figured out a way to successfully convert a common wood byproduct into hydrocarbon molecules that could be used as jet fuel. Bin Yang, an associate professor of biological systems engineering, said the hydrocarbons from his new procedure could eventually replace the need for petroleum-based fuel sources. The work of Yang’s team will be on the cover of the December issue of Green Chemistry, a journal of the Royal Society of Chemistry. Yang also holds a patent on the process: http://www.google.com/patents/WO2014163652A1?cl=en. 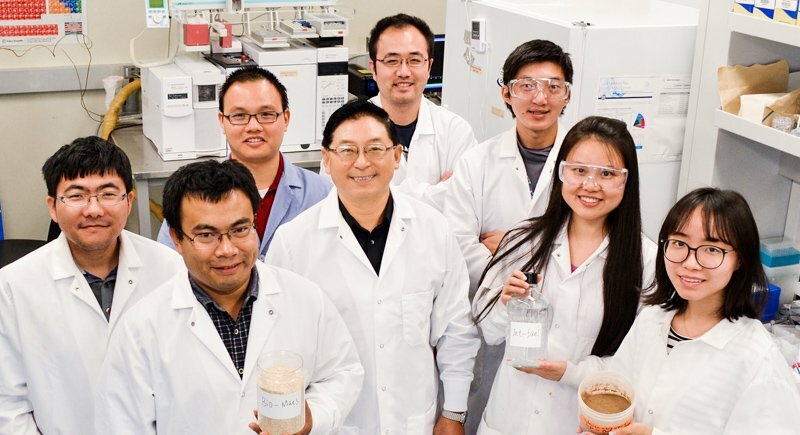 Yang’s procedure converts lignin, an organic polymer that makes plants woody and rigid. Ordinarily, it is wasted when plant biomass, including cellulose, is converted into biofuels like ethanol. “After cellulose, it is the most abundant renewable carbon source on Earth,” according to the website of the Switzerland-based International Lignin Institute. Between 40 and 50 million tons of lignin are produced annually worldwide, mostly as a non-commercialized waste product, according to the institute. Yang said the process could grow the economic potential of advanced biofuels. “It will begin to address the nation’s challenge for the production of clean, domestic biofuels that can help replace crude oil,” he said. Yang’s team is working with Boeing Co. to develop and test the hydrocarbons targeted to be jet fuel. Yang’s procedure converts lignin into a mix of hydrocarbons in a single reactor using appropriate catalysts. The resulting product must be separated and purified to obtain the jet-fuel hydrocarbons that can be used in turbine engines. Ralph Cavalieri, director of WSU’s Office of Alternative Energy, said molecules derived from biomass currently must be combined with petroleum-based jet fuel to meet the certification requirements for jet fuel. Yang’s procedure, however, may be able to supply the molecules that are necessary to be certified as a jet fuel. Jet fuel typically needs molecules that consist of 12 to 16 carbon atoms to fulfill jet engine requirements, Cavalieri said. Comparatively, gasoline requires molecules with fewer carbon atoms, but that fuel is much more volatile. On the other end of the spectrum is diesel, which requires molecules of 16 to 20 or more carbon atoms. While it is significantly less volatile, diesel begins to gel at cold temperatures. Cavalieri said jet fuel requires the same nominal range of molecules as kerosene, which isn’t as volatile as gasoline but also doesn’t freeze at the cold temperatures found at altitude. “With the research being conducted by Dr. Yang, it may be possible to develop a more complete suite of molecules required for turbine engine systems using only biomass feedstocks, making the process more economically feasible and efficient,” he said. In addition to hydrocarbons suitable for jet turbine engines, Yang is using lignin to produce a variety of other chemicals and materials. Through two recent grants funded by the U.S. Department of Energy, both headed by Texas A&M University, he leads WSU’s effort to produce lipids and bioplastics created from lignin. He also is working with the nearby Pacific Northwest National Laboratory and the National Renewable Energy Laboratory in Colorado on projects to convert lignin into a range of chemicals, including supercapacitors. Yang and his team’s research is supported by the Defense Advanced Research Projects Agency through the U.S. Department of Defense, as well as the U.S. Department of Energy, the National Science Foundation, the Sun Grant from the U.S. Department of Transportation, the National Renewable Energy Laboratory and the Seattle-based Joint Center for Aerospace Technology Innovation.